When is LEGO VW Camper retiring? Many collectors have been wondering this for years now as set 10220 approaches four years on the market. The short answer is that interested buyers will likely want to purchase now or risk missing out on this excellent set. LEGO 10220 Volkswagen T1 Camper Van is an advanced model with 1332 pieces and has been a very popular item at LEGO stores. This set has a lower cost than other advanced sets, but is still a large, detailed model of a very recognizable vehicle. For these reasons, it has been a popular choice for new adult fans of LEGO to experience their first adult-centric LEGO product at an attractive price point. Reviews of this set have been very positive and it is likely to be a valuable set in the aftermarket when it retires. 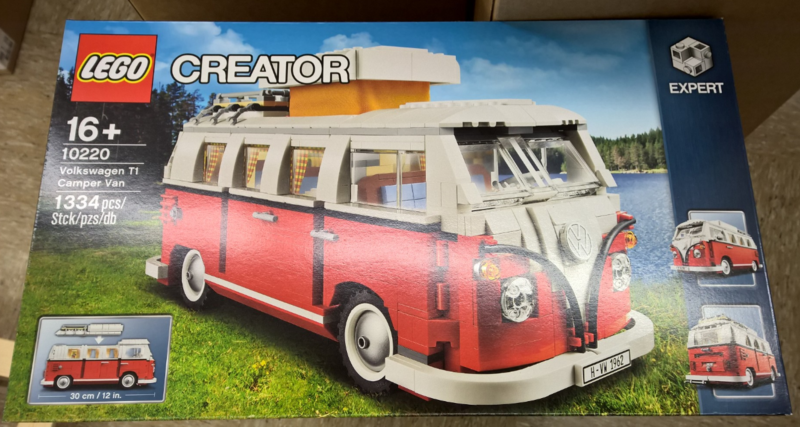 Is LEGO VW Camper Retiring Soon? So when is the LEGO VW Camper retiring? The Volkswagen T1 Camper Van is at very high risk of retiring soon for a few reasons. First, 10220 has been available for nearly four years now. That is considered a very long lifespan for a LEGO set and sets of that age have shown that they can retire at any time. Second, LEGO has since introduced the 10242 Mini Cooper and the 10248 Ferrari F40 cars to their Creator Expert lineup of vehicle models. There is only so much shelf space for advanced vehicle models, so logic dictates that the oldest one will have to go at some point and thus there is a high risk of the LEGO VW Camper retiring soon. Indeed it’s quite likely this set is finally going to be retired later this year. If you don’t have one yet it’s time to get one now. Why would LEGO Company put the effort in redesigning the box if they were thinking of retiring this set by late 2015 ? Well first off, this article was written before the box redesign was discovered. After the box was redesigned, we downgraded the T1 from high risk of retirement in 2015 to medium risk because as you say, it makes no sense to redo the box if it was going to retire immediately. That said, this set is old and won’t live forever. And it’s currently unknown how the current scandal at VW could affect their relationship with The LEGO Group, if at all. Even if this set doesn’t retire immediately, it is undoubtedly still in the later stages of its lifespan, and thus still carries some risk of retiring soon. Lego 10248 Ferrari F40, seems impossible to obtain, only one on Amazon left and just a handful on eBay, is it going to be retired end of this year do you think? Hi Rich, the Ferrari F40 was just released earlier this year, so there’s virtually no chance that it will retire this year. And I wouldn’t bet on it retiring next year either. It should be around for a while. I believe that while sets are available at Lego Shop at Home, there’s no big reason to see so many on Amazon or ebay. But when retirement approaches I guess they start to show up on those two sites. I just notice there is number like a code under the price in a drop down menu. In Australia, there are two numbers…One is still available, the other one retired. Hi Kurt, I believe one product listing is for the old box and one is for the new updated box. Why they would need to show both to the customer like that, I cannot say. Ford teams up with Lego! New Mustang and ‘redesigned’ F150 Raptor available 1st March 2016. Of any relevance to VW Camper retirement? Ups no relevance these are new mini vehicles to be released soon. Just purchased 10220 used, but in great condition with box and manuels. Hoping to build, play, display, and then sell. Space is limited so I can’t really keep many sets. So you guys think by the end of this year it should be retired? Maybe sooner?